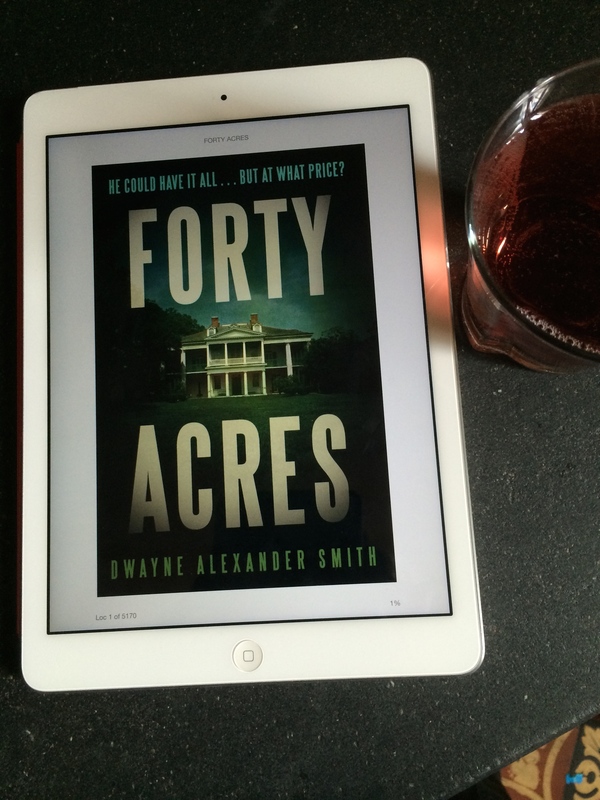 I picked up Forty Acres by Dwayne Alexander Smith, while browsing on Amazon. After reading the premise of the novel I was immediately intrigued and wanted to know more about it. So September started with a bang! I definitely made the right decision. Forty Acres, is about a young upcoming African-American Civil Rights lawyer who gets involved with a secret organisation of affluent African-American businessmen. Little does he know, they are resolute in the idea of preserving slavery where they are the masters and white people are their slaves. The novel is extremely engrossing, a real page turner, and very difficult to put down. Smith’s writing is fully descriptive and his clever way of telling the story explains the legacy of slavery in details that the average person may not be ready to read, but tells the cold hard history that is never told in history class. Martin Grey, the main character, is intelligent and a bit of an idealist and at times does things that we as the reader know are a bit reckless but we can’t help but like him and root for him, all the same. I had the great pleasure of interviewing Dwayne Alexander Smith. Check out the interview below to learn more about this budding novelist. 1. I really enjoyed reading Forty Acres. Could you tell us how you came up with the idea for this story? Forty Acres started out as a sci-fi story, believe it or not. A black astronaut crash lands on earth, but in the past, during the period of American slavery. Unable to speak due to an injury, he is captured an held captive on a plantation with African slaves. I loved the idea for this story because it would give us a modern black man’s view of slavery. Unfortunately I couldn’t make the story work the way I wanted. After lots of rethinking Forty Acres took on the form it has now. 2. With all that’s been going on racially in the United States at the moment, how has your book been received? I think that the book has been received well considering the tough and uncomfortable subject matter. Slavery is a touchy subject in the United States. Many readers who are looking for something entertaining to read, won’t easily select a thriller centered around such a sensitive topic. Surprisingly, the book has been better received in Europe. 3. I can say being a black American that I was very proud to see your book placed on the new releases wall at WH Smith in Paris. How have you been accepting the attention? The attention from readers around the world has been the best part of having Forty Acres published. Right before sitting down to answer these questions I read an email from a gentleman in the UK who loved the book and just wanted to let me know that. Also, a week ago I found out that I have been nominated for a NAACP Image Award. I was blown away by this news. The attention is great and very addictive. 4. I heard that Forty Acres started as a movie script. Could you tell us a bit about the process of adapting a movie script to a novel? Well, Forty Acres was never actually a script, it was an idea for a script. I’ve never actually adapted a book into a screenplay, but I hope to have that problem if and when the Forty Acres movie rights are acquired. 5. Martin Grey is an interesting character, but most of all Dr. Kasim, who is one hell of a villain. Will there be a sequel to 40 Acres or other novels with Martin Grey as the central character? Yes there will be a sequel. Will that sequel be published by a major publisher or self-published by me is the only unknown. Book sales will be the deciding factor. Regardless of how it reaches the public I do plan to write a sequeI. I have the story figured out and yes Martin will play a central role. Also, I think a lot of women will be happy to know that Martin’s wife Anna will have a much larger role. 6. Forty Acres is centralized primarily around black men. What were you trying to accomplish with that dynamic? From the very beginning, when Forty Acres was a sci-fi tale, I just wanted to find a new way to tell a story that involved American slavery. It’s amazing that more movies aren’t made about slavery, considering its lasting impact on American culture. 7. Are there plans for Forty Acres to be adapted to film? No plans as of yet but there’s a small army of people in my corner, agents, managers, and lawyers, trying to make that happen. The truth is that Forty Acres scares a lot of producers. It’s controversial and very in your face and that projects like that tend to make the powers that be in Hollywood queasy. It’s going to take a producer with vision and courage to bring Forty Acres to the screen. It will happen, it’s just a matter of when. 8. Are you working on a second novel? If so when will it be released? I am working on another thriller called White Widow. No one has seen it yet so there’s no publishing deal or release date in place. Right now I’m just laser focused on making it as good as possible. Forty Acres has a lot of fans, many of which have stated in reviews that they are eager to read my next book. The last thing I want to do is let my newly found fan base down. For that reason I’m working really hard to get White Widow right. 9. What advice can you give to other black writers that are trying to write, to get published, and recognised? ​I get this question a lot. The advice I give doesn’t just apply to black writers but to all writers who are trying to break into a writing career. I firmly believe that the best way to grab the attention of publishers and readers is to have an amazing idea for a book. Dozens of thrillers about cops chasing bad guys cross the desks of editors everyday. What’s going to make yours stand out? I’ve wanted to write a novel for a very long time but I knew that when I did I had to have a killer idea, an idea that would demand attention and interest. When I came up with the idea for Forty Acres I had a great time telling people because I loved to see their stunned expressions. That’s how I knew I had a solid concept. So my advice to writers is simple. Before you sit down to write, spend as long as it takes dreaming up an idea that will set mouths agape and widen eyes. When you nail that you’ll know that you’re on the right track. Big thanks again to you Dwayne Alexander Smith for taking the time out of your extremely busy schedule to answer these questions. Good luck with your future writing! Great interview-thanks for sharing! I picked up Forty Acres and hope to finish it this week amid holiday activities. Thanks Phyllis! It’s not a festive holiday read but I enjoyed and am looking forward to his future novels. Great interview, I’m anxiously waiting for my book to be delivered. OK, I can’t wait for part II. Talk about a serious moral dilemma? Yes but I’m sure Dwayne Alexander Smith is going to give us a whirlwind ride of story to make us think. What a brilliant author I can not wait to read his next novel The book was gut wrenching but an eye opener as well! My boyfriend and I read books together and then discuss them…we wr so impressed with this book and look for from this Author. …4/16/17….